Dynamic CDC is working with the Puerto Rican Leadership Council to provide both immediate and long term assistance services to Puerto Ricans arriving in Florida as a result of Hurricane Maria. Among the services to be offered are: assistance with housing and employment; vouchers for the purchase of food, clothing and school supplies; medical care; school registration; and counseling for social/personal problems created by the trauma of being uprooted. On Friday May 12, 2017, the eighth annual Puerto Rican Summit was held at the DoubleTree Hilton at Seaworld. The Summit hosted speakers and guests from all regions of Florida, Washington DC, New York and Puerto Rico. The Summit featured four workshops and a Business Luncheon entitled “Florida – Puerto Rico: Two Markets that Work for You”. As in past years, Dynamic Community Development Corporation (CDC), a 501 (c) 3 community and economic development corporation, was the principal sponsor and organizer of the event. The Summit is held annually in Central Florida. In 2014, Florida’s Puerto Rican population surpassed the one million mark. Since then, the state’s Puerto Rican community has continued to grow, with Central Florida as the destination of for the many new residents arriving from the Island. On Thursday evening, May 11th, a special VIP Reception honoring sponsors and members of the Summit Organizing Committee, was held with the sponsorship of Rums of Puerto Rico and Boricua & Taino Beers. The newly elected Florida State Senator Hon. Victor Torres was acknowledged, and Mr. Brendan Ramirez, Executive Director of Pan American Behavioral Services of Florida, received a special award for the annual support of the Summit. Friday May 12th began with “Café con Leche with your Legislators” – a meeting with local federal and state legislators. Present were: US Congressman Hon. Darren Soto, Hon. Victor Torres, FL State Senator; and Florida State Representatives Hon. Amy Mercado, Hon. John Cortes, and Hon. Carlos Guillermo-Smith. These lawmakers discussed issues of importance to the Central Florida community, especially the bills presented during the most recent Florida State Legislative session. The third panel “Healthcare & Community Development” was moderated by Mr. Eduardo Arroyo, President, Arroyo & Associates, San Juan, Puerto Rico. The panel members discussed the important roles their organizations play in supporting ongoing physical and mental community health care initiatives, as well as their work following the Pulse Night Club shooting in June 2016. On this panel were: Mr. Brendan Ramirez, Executive Director, Pan American Behavioral Services of Florida; Ms. Stephanie Pineiro, Community Health Manager, Proyecto Somos Orlando, Hispanic Federation; Ms. Norma Asencio, East Florida Sales Manager, Wellcare Health Plans; and Ms. Gaby Ortigoni, Regional Vice President, PROSPERA. The Summit Business Luncheon – always popular and well-attended – was hosted by Master of Ceremonies Ms. Olga Aymat, on-air talent, news anchor and reporter with Telemundo. The Summit organizer, Dynamic CDC, together with Hon. Wanda Rentas, Vice Mayor of the City of Kissimmee, presented a check to the Borinqueneers - the 65th Infantry Regiment of the United States Army – received by a Borinqueneer who served in the Korean War. 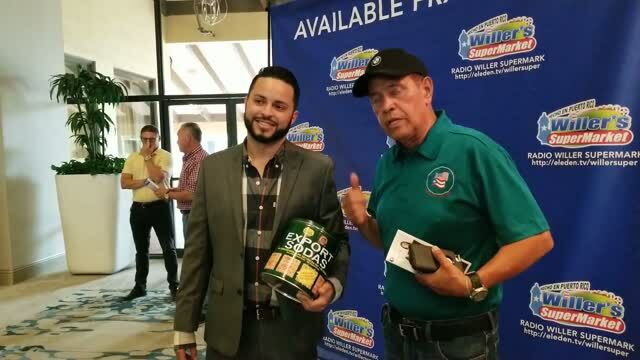 Also present was Mr. Oscar Gonzalez of Clean the World – an organization dedicated to distribution of soap and other hygiene products internationally – who, with the help of Summit attendees, prepared two hundred health kits for donation to Proyecto Somos Orlando. Welcoming Remarks were presented by Hon. Tony Ortiz, Commissioner, City of Orlando and Hon. Wanda Rentas. Special Remarks were made by Hon. Darren Soto and Mr. Julio Benitez-Torres, Esq., Deputy Secretary of the Puerto Rico Industrial Development Co. (PRIDCO). The Keynote speaker was Hon. Carmelo Rios-Santiago Esq., Majority Speaker of the Puerto Rico Senate and Vice President, National Hispanic Caucus of State Legislators. Following the Luncheon, the fourth and final workshop entitled “Puerto Rico: Financial & Economic Development Initiatives” was moderated by Mr. Arnaldo Soto, Vice President, HUB International, Puerto Rico. Panel members were: Mr. Carlos Mercader Esq., Executive Director of the Puerto Rico Federal Affairs Administration (PRFAA) in Washington DC; Mr. David A. Rodriguez-Ortiz, President, Cámara de Comercio de Puerto Rico, San Juan; Hon. Carmelo Rios-Santiago Esq. ; and Mr. Julio Benitez-Torres Esq. Their discussion centered on the ongoing financial difficulty in which the Commonwealth of Puerto Rico currently finds itself, the efforts – both from within the Island and by the Federal government – to alleviate the debt crisis, and the continuing status of Puerto Rico as a market for trade, business, investment and tourism as a means for the Island to grow economically and to stem the current migration from the Island. The Summit wishes to acknowledge its many sponsors whose generosity made the event possible: Hispanic Federation; Walmart of Puerto Rico; Florida State Hispanic Chamber of Commerce; Kissimmee Utility Authority (KUA); Goya Foods of Florida; Wellcare Health Plans; Wyndham Worldwide; the Republic Party of Florida; Borinquen Medical Centers of Miami-Dade County; the Democratic Hispanic Caucus of Florida; Vista Security International; La Prensa Orlando; Boricua Beer; Clean the World; the Integrated Marketing Group; Rums of Puerto Rico; Auxilio Global Health; Gufiao Entertainment; and the Pan American Behavioral Health Services of Florida. The Summit Organizing Committee thanks Ms. Miriam Martinez of San Juan, Puerto Rico, whose work as Event Coordinator was central to its success. Pic 1 L-R : Luis DeRosa; FL State Senator Victor Torres; FL House Representative John Cortes; Norma Asencio, East Florida Sales Manager Wellcare Health Plans; Puerto Rico Senator Carmelo Rios-Santiago; and US Congressman Darren Soto. Sitting L-R: Julio R. Benitez-Torres Esq., Deputy Secretary, Puerto Rico Industrial Development Co. (PRIDCO); Hon. Carmelo J. Rios Santiago, Senator, Majority Speaker, Puerto Rico Senate; David Rodriguez-Ortiz, President, Cámara de Comercio de Puerto Rico, San Juan; Carlos Mercader, Esq. ; Executive Director, PRFAA, Washington D.C..